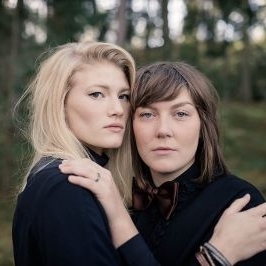 The music of our next LCM featured artists Swedish duo Good Harvest (Hanna Enlöf and Ylva Eriksson) has been described as "extraordinary beautiful, emotional and well crafted". They call themselves musical twins, which shines through the inter weaved harmonies and excellent interaction on stage. Quite simply they have the 'wow' factor. Conjuring the vibe of groups like The Staves and First Aid Kit and Joseph. Their journey together has had an impressive start and along the way they’ve garnered a vast and devoted fanbase. It seems almost unlikely that it hasn’t been more than two years since they randomly ended up on a stage together and found their musical home in Good Harvest. In 2014 they released their EP 'Bottom Dollar'. To best describe their music, imagine a mix of how Simon & Garfunkel play together, add the harmonies of Nick Drake and finish of with the strong approach and narrative style of Gillian Welch and you get a great amount of musical warmth and a big craving for more. Safe to say, a lot of people are looking forward to their debut album 'In A Life & Place Like This' (Released 31st March 2017) with great expectations. We are sure it will leave no one disappointed when it comes out in a near future.